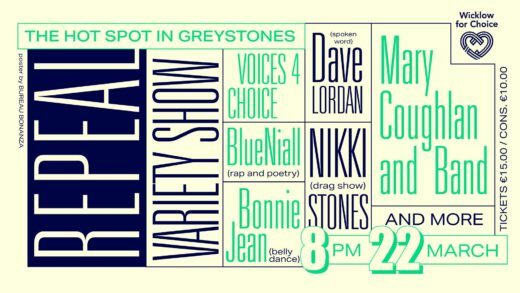 Join Wicklow for Choice for a jam packed variety fundraising show on Thursday, 22nd March in The Hot Spot, Greystones. We are very excited to announce a truly wonderful line up we have put together of local talent (and beyond) for your enjoyment. We also will have a raffle on the night with prizes to include pieces donated from local artists such as Doug Ross. Make sure to get your snap taken too with one of the many professional photographers attending to capture the memories. Stick around afterwards to have a drink, a chat and a dance to our dj and we can discuss as a collective how we can bring about a repeal of the 8th Amendment and make Ireland a safer place for women, our families and our children. Entry includes free raffle ticket.